I recently discovered Itha and they made a great first impression so I asked Kelly (the founder) if she would like to introduce herself and products to my readers. Tell us a little bit about yourself and how Itha began? A few years ago, Itha’s founder Kelly from South London decided to make a career change from the fashion industry to beauty & cosmetics. She embarked on a series of training courses and now plans to create a range of organic and natural cosmetic products, starting with tinted lip colour and lip care. Kelly has been a vegetarian for over 10 years and has always been interested in a natural organic life style. She suffered from chapped lips in winter, and found it hard to wear various chemical based lip balms, or lip colour due to the dry condition of the lips. After a long period of preparation and planning which involved help from a lot of creative people, countless trial and errors, and feedback from friends / families, Itha’s first organic lip collection was born. 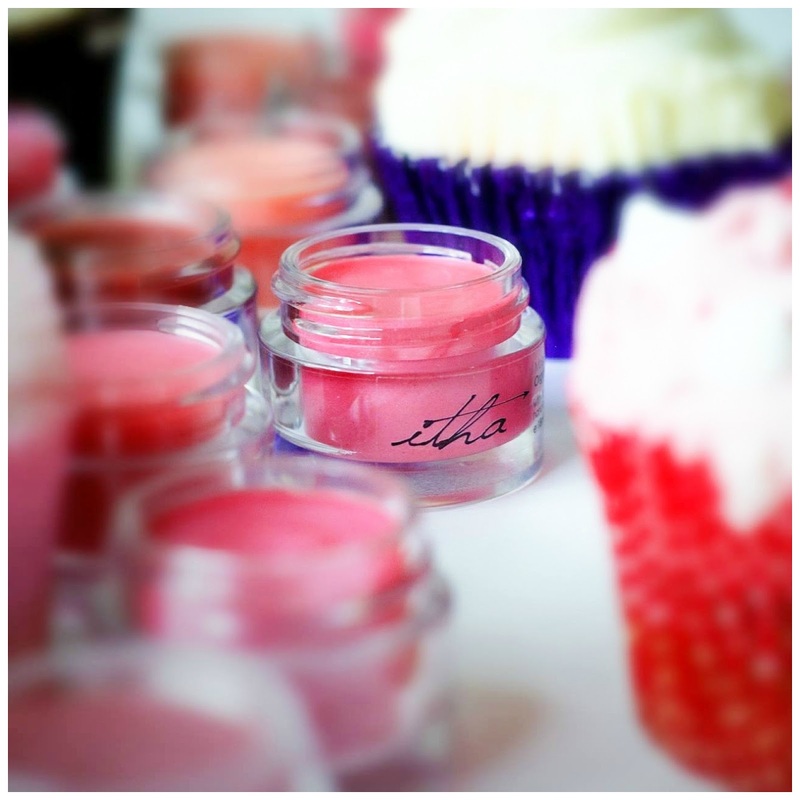 So far, Itha has launched 5 organic lip glows and lip care in the UK, all vegetarian friendly. The organic lip glow offers moisturising benefits and a subtle sheer colour that is the perfect balance of lip balm and lip colour. The philosophy behind the London based brand is understanding all of the ingredients behind the products and formulating them with the purest and finest organics to achieve an effective result. Itha is an interesting brand name, can you explain if there is a story behind choosing the name, does it have a special meaning to it? When Kelly was considering a career change, she went travelling and visited a delightful vineyard in Ithaca, New York. The landscape was picturesque, green, and inspiring and it was here that she made the decision to create a line of organic, green beauty products. On returning to London it was decided that a name with a subtle reference to that place should be created, so she decided to call the brand itha. Why are natural/organic cosmetics important to you? Skin is the largest organ of the body and it is important that we take good care of it. Natural / organic cosmetic products are not only good for you, but also minimize the chance of getting irritation on the skin. What do you find most challenging when formulating products? 100% Concentration and dedication. When formulating and testing new products, it can be a very long process, and needs a lot of attention. On a typical day like this, I will switch off my phone and try not to be interrupted by the outside world until the work is ready to move on to the next stage. What have been the highs and/or lows of establishing Itha? Highs- when you see your initial thoughts transition from a piece of paper into a finished product and then being passed to customers, not to mention their happy reactions, it makes all the hard work totally worth it! Lows- when testing new products or formulas, things can always be tricky as you are looking for flaws within these products and need to find ways to overcome it. Sometimes when there are no better solutions you know you have to drop it and move on. It can be a bit frustrating at times. It's great to see your products are cruelty free and Vegetarian friendly however many of my readers are Vegan, may I ask if in the future you might look to formulate some products suitable for Vegan customers? There is a plan for expanding the organic range, and my initial thoughts will be to produce vegan lip products but everything is still at an early stage. Like other Itha products, the new vegan range will still be organic and 100% natural. We will post updates on our social medial sites, and hopefully release a vegan line in the not too distant future. What does the future hold for Itha? Itha has been accepted as an entrant for the Free from skincare awards 2015, and is going to exhibit in this year’s Love natural love organic show in Olympia London in 3-5 July. All products are handmade in London and currently available online. We are working on having the Itha products available through more beauty retailers / boutiques and reach out to more people who are in pursuit of natural beauty. The brand is new, fresh, and lively, and we are happy to engage with our customers / online followers / bloggers, and receive their ideas and feedback. From time to time, there will also be product giveaways via our social media and website! Do you have any skincare/makeup tips to share with readers? Beauty comes from within, and your face mirrors your body and health. A healthy lifestyle is the key to maintaining a beautiful appearance. Having a balanced diet and exercising regularly are just as important as having a good skincare routine. When your body sweats, your body detoxes which helps to make your skin glow. Opt for tinted lip products rather than lipstick in winter to help reduce the dry lip conditions. When removing lip colour, use balm / oil based cleansing and gently massage it to remove any remaining colour. Avoid using makeup removing wipes, or any harsh rubbing on the lips as it might cause them to wrinkle. Keeping your lips moisturised and hydrated all through the year will make you look young and fresh, it looks a million times better than having chapped lips with colour on. My best tip however for beautiful looking lips would be to stay healthy, and use good quality lip products together with a smile. Itha has kindly offered to provide one lucky reader with a Lip Glow. Complete the Rafflecopter widget to enter this giveaway. Entries with the required information missing will be disqualified. This Giveaway is open to readers 18 years or older with a UK postal address. Winners must respond within 48 hours or another winner will be selected at random. Prize will be sent directly to winner by Itha. Comments published at my discretion depending on volume received. I do not give permission for giveaways to be posted to other websites. I think it would have to be an orange-y red as I'm a bit obsessed at the moment. I have absolutely no idea what i'd call it that's a really tough one! Thanks for introducing me to another great brand and for the giveaway! If I was to create a lipstick, it would be a coral colour and I'd call it Ariel! Wonderful interview! I love the story behind the name and brand. Their products sound lovely. If I could create a color, it would be a reddish-pink and I would name it Veronica after a beautiful friend I had. She was confident, fearless, bright, and had this way of commanding a room. Aw lovely interview! Hopefully I'll get to meet Kelly at the LNLO show in July. I would make a bright pink lipstick and call itttttttttttttttt I have no idea...I'm so bad with names! However...I was Itha's 100th like on Facebook, woop! This looks like a lovely brand, I'd be keen to try something of theirs and see how they are.